The biggest addition to the lightly revised Audi R8 V8 is under the hood where the Berman automaker tweaked the V-8 engine to deliver an extra 10 horsepower over the previous version. There is also a new seven-speed S tronic gearbox. Since a redesign is on the horizon, Audi kept the exterior updates to a minimum. These updates include a new front bumper and single-frame grille. Updated 07/02/2014: Audi announced prices for the entire 2015 R8 lineup, including the base R8 V8 version. For 2015 prices increase by $1,000 for the manual version and $900 for the R8 with the S tronic transmission. Updates for 2015 include new exterior paints, red brake calipers, a new Quilted Leather package in Silver, and a new diamond-stitched Alcantara headliner. UPDATE 04/11/2013: Audi USA announced today prices for the revised R8 set to go on sale today, April 11th, 2013. Prices for the base R8 version start at $114,900 and go up to $179,645 for the R8 V10 Plus equipped with the S-tronic gearbox. Full prices after the jump. UPDATE 05/10/2013: Audi has unveiled a new video revealing how the facelifted R8 is being "handcrafted" at the company’s factory in Neckarsulm. Enjoy! For the exterior, the facelift Audi R8 has received a new single-frame grille with the beveled upper corners painted in high-gloss black, a new bumper with the air inlets bearing three crossbars each, and new matte black vent louvers. As an option, customers will receive a carbon fiber reinforced plastic (CFRP) front splitter. 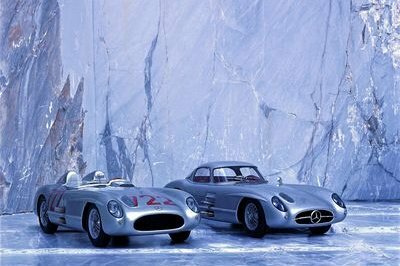 All models will now be offered with standard LED headlights. 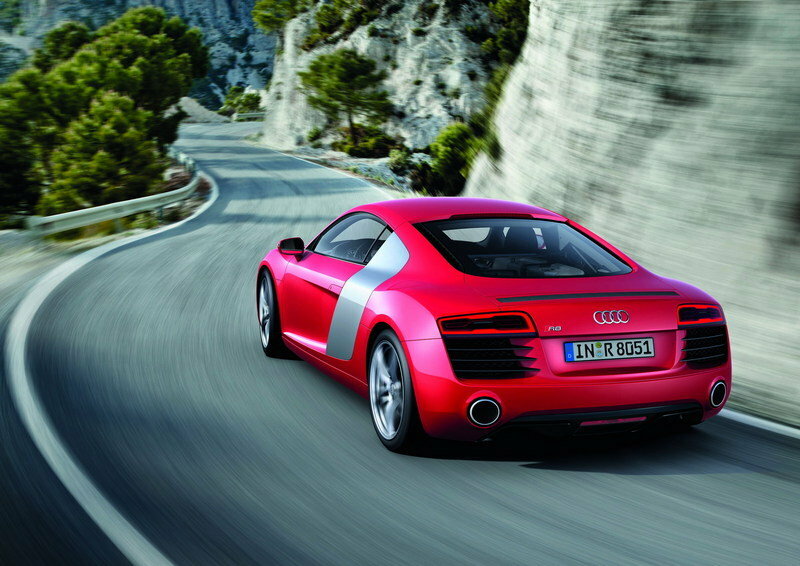 The Audi R8 features an aluminum body that weighs only 462.97 lbs bringing the total weight down to just 3439.21 lbs. On the interior, numerous control and trim elements are covered in chrome strips or black paint, while the instrument cluster and the shift paddles have been slightly modified. The center console and the handbrake lever are covered with leather and can be combined with Fine Nappa full-leather on the seats and door trim or Alcantara, available as an option. 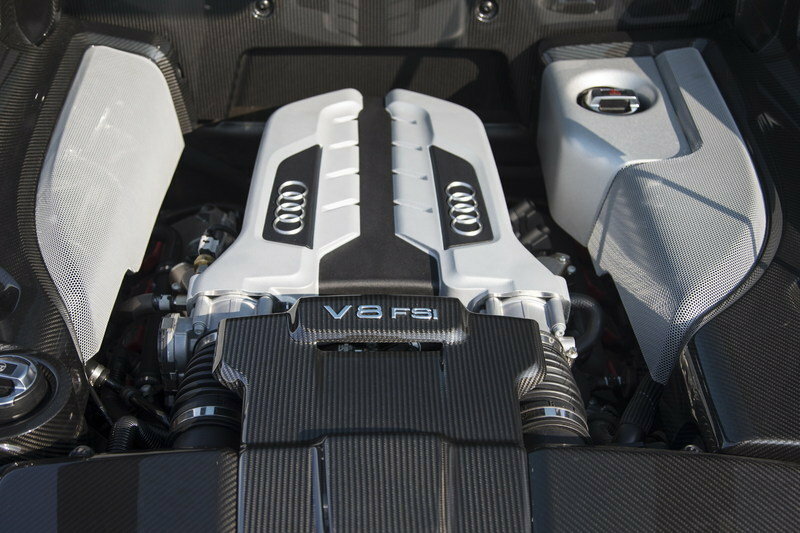 Under the hood, the 4.2 FSI V-8 engine for the R8 has been updated to deliver a total of 430 horsepower at 7,900 rpm and 317.15 pound-feet of torque delivered between 4,500 and 6,000 rpm. 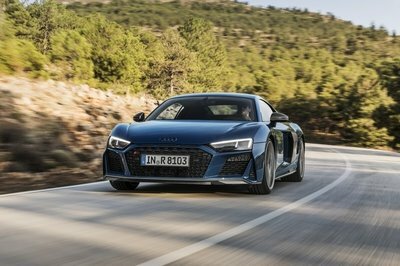 The biggest change for the updated R8 is the addition of a new seven-speed S tronic transmission system replacing the existing six-speed R-Tronic. The new transmission features two multi-plate clutches that serve two mutually independent sub-transmissions allowing minimal delay between gear changes. When equipped with the S tronic transmission, the R8 will go from 0 to 60 mph in 4.3 seconds and up to a top speed of 186.41 mph. 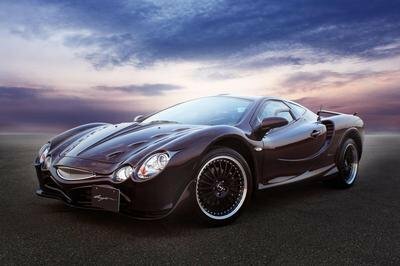 With the manual transmission, these numbers changes to 4.6 seconds and 187.65 mph. 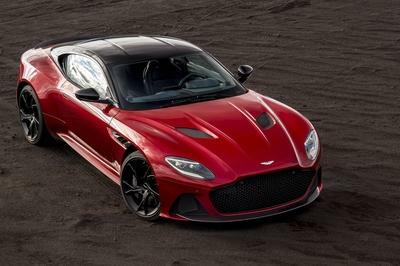 The GranTurismo S, on the other hand, gets a 4.7 liter V8 engine that delivers a total of 440 horsepower, 10 more than the R8. When it comes about look, we have to admit we like the Maserati model a little better, but on the other hand, the R8 has a more aggressive stance on the road. 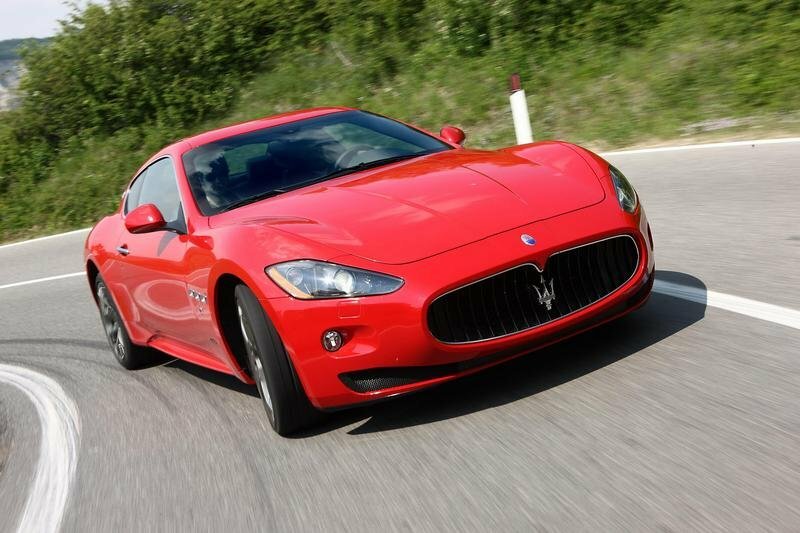 The GranTurismo S is priced at $126,000. 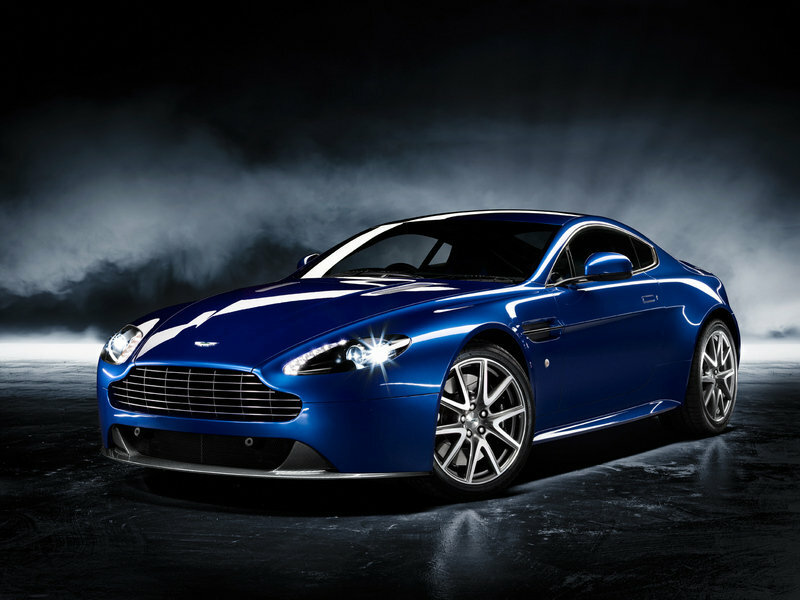 The Aston Martin V8 Vantage is powered by a V8 engine that delivers a total of 430 horsepower at 7,300rpm and 361 pound-feet of torque at 5,000rpm. 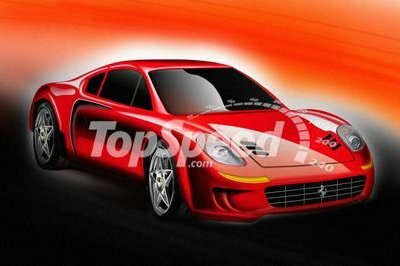 The engine mated to a Sportshift II close-ratio seven speed automated manual transmission. The V8 Vantage S is priced at $136,300.